In this article, we will learn how to use Razor Pages in ASP.NET Core 2.0. Razor Pages are introduced in ASP.NET Core 2.0 to make building simple web applications quicker and is a good way to play with various ASP.NET Core concepts like Razor, Layout Pages and Tag Helpers etc. Razor Pages are introduced in ASP.NET Core 2.0 to make building simple web applications quicker and are a good way to play with various ASP.NET Core concepts like Razor, Layout Pages and Tag Helpers etc. In this article, we will learn how to use Razor Pages in ASP.NET Core 2.0. Create an empty project and amend Startup.cs to add services and middleware for MVC. Add a service and domain model (implementation of IMovieService is just in-memory list in sample source code). Add input and output models (to receive and send data via property bindings). Add a folder called Pages and add Index, _Layout, _ViewImports and _ViewStart pages to it. These pages are no different than MVC. Also, add a folder named Movies to the CRUD pages. Add 4 new RazorPage items to the Movies folder, called Index, Create, Edit, and Delete. These will add .cshtml and .cshtml.cs files. Run and browse to /Movies. You could download the source code to play with it. Razor Pages use ASP.NET Core MVC under the hood however the programming model is not the same. 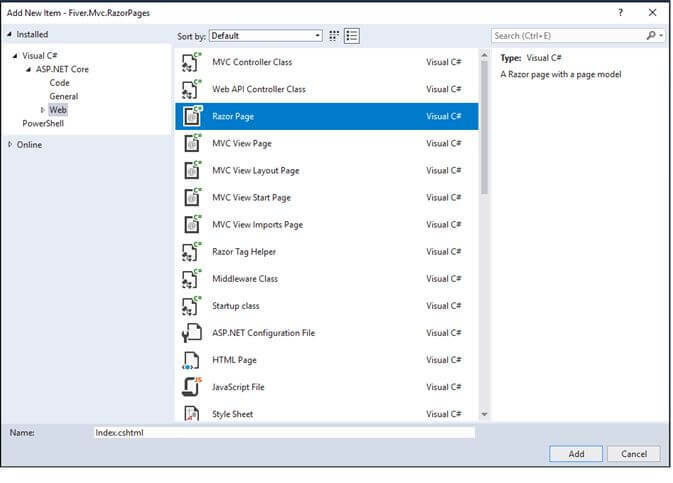 Unlike MVC where Controllers, Models, and Views are distinct and separate components of the architecture, in Razor Pages, these concepts are brought together under one roof, Page Model. I like to think of Page Model as a combination of Controller and Models. Like controller because they receive the HTTP requests and like the model because they hold the data/properties for views. For a .cshtml file to act as Page Model, it must contain as its first line the @page directive. The .cshtml.cs (code-behind) class inherits from PageModel abstract class. By convention, the code-behind class has Model appended to page’s name e.g. Index page’s code-behind is IndexModel. Routing to pages depends on their location in your project directory structure, under the Pages folder (by default). If a page is not specified in URL, the default of Index is used. In our sample, we navigated to URL /Movies to view the page located at /Pages/Movies/Index in our solution. Similarly, the URL /Movies/Edit maps to /Pages/Movies/Edit page. If you prefer to use a different name than Pages for your root folder, you could do so by configuring page options. As mentioned earlier, the page receives HTTP requests (i.e. acts as an Action in MVC world) and these are handled by the handler methods. These handlers return IActionResult and named using the convention of On[verb]. Most commonly used are OnGet() and OnPost(). For asynchronous you could append Async to the name, but this is optional. The PageModel base class has RedirectToPage() method (that returns RedirectToPageResult) to navigate to other pages and Page() method (that returns PageResult) to return the current page. Note that if return type of handler method is void, runtime returns a PageResult. Move your mouse over the Delete link and you’ll notice the URL like /Movies?id=1&handler=delete. If you prefer to replace query parameters with URL segments then add following route constraints to the @page directive and generated URL will be /Movies/delete/1. @model directive on pages points to the page model class because as mentioned earlier, this class acts as the model for Razor Pages. This works for reading the properties however in order to populate them when posting data (i.e. when using verbs other than GET) we need to use an attribute [BindProperty] to mark properties to use Model Binding.